April 4, 2017 - The Chief Rabbi of the Jewish Community of Rome, Rav. Riccardo Di Segni, has announced the reburial of the skeletal remains of thirty-eight individuals, including two children, that were unearthed by archaeologists during renovation work on Palazzo Leonori, originally constructed in 1927 over a Jewish cemetery in use between the Late Medieval and Early Modern eras. The work is now complete on the Viale delle Mura Portuensi, 33 for the new tenant, the insurance agency Assicurazioni di Roma (AdiR). Coordinating and carrying out the reburial were representatives of the Jewish Community of Rome and Israeli experts on the ritual process of transferring and interring human remains according to Orthodox Jewish tradition and belief. In Rav. Di Segni's words: "We (the Jewish community) have fulfilled an important precept which teaches great respect for life and the human body until it returns to the dust from whence it came." The original Italian text of the report is below. Sono stati sepolti al cimitero di Prima Porta di Roma i resti scheletrici risalenti al Medio Evo e ritrovate nel "Campus Iudeorum" di Trastevere durante gli scavi per la nuova sede di Adir. Alla sepoltura ha provveduto una squadra di esperti arrivata appositamente da Israele in stretta collaborazione con la Comunità Ebraica di Roma che ha permesso che i resti scheletrici venissero trasportarti e inumati nel più breve tempo possibile e nella rigida osservanza della legge ebraica. "Abbiamo avuto il merito di adempiere ad un importante precetto che insegna il grande rispetto dovuto alla vita e al corpo umano fino al suo ritorno alla polvere dalla quale è stato preso. Lo dichiara in una nota il Rabbino Capo di Roma Riccardo di Segni. 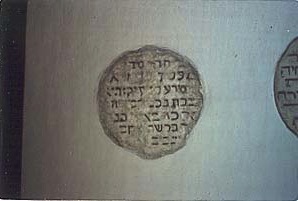 Image: Hebrew epitaph from the Campus Judeorum now in the Lapidary Collection at the Church of San Paolo fuori le Mura, Rome. International Catacomb Society, n. 3702.